Digital marketing doesn’t have to be daunting. Over time, developing a strategy that is right for your business’ online presence has become overly complicated, impersonal and intimidating. 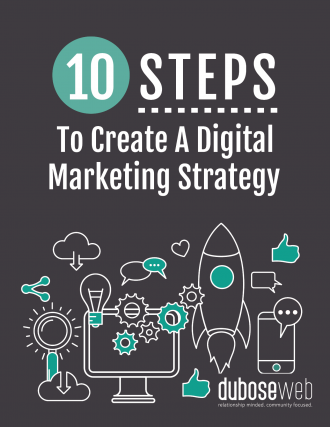 In this free cheat sheet, we break down the whole process into 10 simple steps so you feel equipped to design a digital marketing strategy that is effective for your business! We’ve intentionally designed this guide to work for any individual, organization or business, no matter the type or size. Define digital marketing goals that are specific, measurable, attainable, relevant and timely. These goals will be how you measure the ROI of your digital marketing strategies. these audiences’ goals, frustrations and motivations? This is the foundation of everything you do digitally, so invest quality time here. where there is opportunity in the market. a keyword research tool like Serpstat can be extremely helpful. Determine what kinds of content would be valuable for your ideal audience and develop a digital content strategy. What is the goal you want to achieve with content? How will you reach your ideal audience? What are they interested in learning about? Get to writing! with current and potential customers. Offer something relevant and helpful to a website visitor in exchange for their contact information. This could be anything from a discount on products to an eBook to a template. Keep the information on this page targeted and brief, and make sure your call-to-action is strong. Is search engine advertising, social media advertising or both a good fit for your business? Paid advertising is a quick and effective way to attract qualified traffic to your site, and potentially increase leads. Build an email marketing list through blog posts, social media, offers and more. Develop email marketing campaigns that are relevant, compelling and encourage the readers to take action on something. Use a tool like Google Analytics to check how your digital efforts are paying off. Reviewing your analytics weekly or monthly provides valuable data that can help steer your digital strategy in the right direction.